Making a mandala (circular drawing or painting) has long been considered an act of devotion in many cultures all over the world. No matter what your religious or spiritual beliefs, it’s great to have a way to take a bit of time out from the busy-ness of your schedule for contemplation, meditation and renewal. 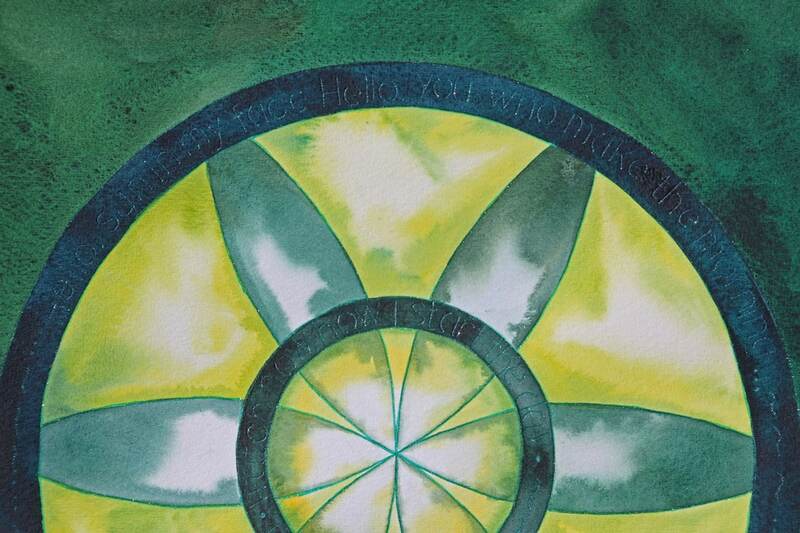 Circles have universal appeal, and powerful symbolism. Starting from a basic formula and adding your own color choices, simple symbols and meaningful words, you can extend this basic formula in infinitely many ways to suit all sorts of different situations and feelings. Watercolor acts at its own pace and in its own way, enticing you to slow down and become absorbed in the creative flow by its own flowing nature. Watercolor is a bit unpredictable, offering you little gifts and surprises, so it encourages openness and a spirit of acceptance. Watercolor is the perfect medium for vivid or subtle color and transparency, so these mandalas appear to have an inner light and life. They are naturally uplifting. I’ll describe this for a finished mandala about 12 inches in diameter, but you can scale it up or down as you wish. Step 1: Make your pattern. I recommend you start with a repetitive pattern, although you can certainly let your mandalas “grow” organically in a free-form way. Take the basic idea and adapt as you see fit. Make a small circle in the center, somewhere between an inch-and-a-half and three inches in diameter. Then make another circle about a half-inch to three-quarters of an inch around it (to make a “ring” about a half-inch to three-quarters of an inch wide). Then make a larger ring about 8 or 9 inches in diameter. The two darker green rings in this example are made by the series of concentric circles in the first step. Using a compass, circle templates, meaningful symbols or shapes you find appealing, make the same pattern in each section of your mandala. This example was divided in fourths, and a heart motif was used, along with some geometric shapes. Step 2. The light areas. Using the “stained-glass” technique described in the earlier article on “Stained-Glass” Mandalas, wet the center circle (or parts of it that are not overlapped by areas you want to make darker), and drop in color along the outside edge. The color will run a bit away from the edge, but leave the center generally clear. Next, wet other areas that you wish to have lighter in the finished mandala and add color to the edges of each area, letting the centers of the areas stay lighter. Notice how dropping the color primarily along the edges allows you to place relatively “light” areas next to each other (such as the “wave” shapes and the light wedges behind them), and still have the appearance of light glowing through them. Step 3: Add darker color to areas surrounding or alongside the light areas to add contrast and intensify the sense of glowing light. This stained-glass mandala was inspired by moonlight peeking through some heavy clouds on a windy night. The spiraling shapes suggested movement to me, echoing the movement of the clouds sailing across the sky. Step 4: Add medium-to-very-dark color around the outside. You can either use darker watercolor, or if you want a lot of contrast, black ink or acrylic, around the outside of the entire mandala. This will further intensify the sense of light in the light areas. Black ink has been used to surround this “prayer for the bees” mandala. Step 5: Embellish by outlining the individual areas of color, adding words, and/or drawing patterns on some areas. The example above has been outlined in black ink. Metallic inks, gel pens or colored pencils also work well for outlining or adding words, poetry or other meaningful text. The words “peace”, “love”, “strength”, “courage” were added in metallic ink, using a lettering template, and the individual areas of color were also outlined in metallic ink. In this example, metallic inks were used to add some line work, embellishing some of the dark areas. A mandala celebrating summer mornings and starting the day with joy and kindness. It’s difficult to see in the photo, but a quote from a favorite poem has been lettered around the two dark rings in metallic green ink. I think you can see that this basic idea can be adapted to just about any purpose you can imagine. And of course, you can make your mandalas far more elaborate that these examples. The examples are typical of what might be completed in a 3-hour mini-retreat, but I often create more elaborate mandalas that I work on over many sessions, particularly if I am trying to reinforce some positive changes in my own life. I often make these mandalas right in my journal. If I want to hang one up somewhere as a meditation focus or encouragement for myself or others, it’s nice to make them on lovely professional-quality watercolor paper, or illustration board or watercolor board. Watercolor paper can of course, be framed, but I don’t always go to that expense for something I’m using for my own meditation. I don’t usually have a particular one up for long enough. Watercolor paper can be tacked up to a bulletin board, or you can use “sticky tac” putty to stick it up to the wall. There are also a variety of “clean removal” adhesive products that you can use to stick a sheet of watercolor paper up for a short period of time. I would advise against using these to stick something up for years at a time, though. I did that with some cork tiles and the “clean removal” part didn’t work as advertised after that long. It was a huge job to get all that adhesive off the wall! If you use illustration board or watercolor board, you can spray the surface with a clear acrylic finish (e.g. Krylon acrylic spray, which is available in the paint department of home-improvement stores. The board is heavy enough to display without a frame, if you like. Or, you can pop the board into a frame without glass. Two or three coats of acrylic spray provides enough protection that you don’t need to frame these under glass, and the board is rigid enough to hold its shape, although you’ll get nicer results if you have a backing board behind it. Let making the mandala be your meditation or prayer. Choosing the colors, words and symbols, watching the magic of the water and the paint, seeing the “glow” develop as the darker areas are added—it’s soothing and contemplative—a perfect way to fix my mind on a positive change I want to make in my life, a new endeavor, something I want to honor and celebrate, or a friend who needs some love sent their way. Make it a mini-retreat with some friends! This is a great stand-alone activity, so why not gather some friends for a mini-retreat and make these together? If you don’t feel up to leading the activity for a group and you’re in the Twin Cities area, I do offer this as an “art-party” or “mini-retreat” activity. More info about that (plus an announcement of an already-scheduled mini-retreat you can sign up for), at the end of the post.